When it comes to investing, one of the biggest mistakes that investors make is making investing decisions based on their emotions. When investor emotions come into play, it can cause them to make unwise decisions, such as buying high and selling low — the complete opposite of a successful investment strategy. Similarly, holding onto a particular stock due to emotional ties can hinder the performance of a portfolio, too. Given the vagaries in the most unpredictable mood swings of the stock market, emotional investing is a dangerous path to go down and it can result in profit losses. In this blog, we are going to review some of the common causes of emotion-based investment decisions as well as helpful tips to avoid them! In the investment world, there are many biases that can affect an investor’s decisions. One set of these biases is emotional bias. Emotional bias is caused by individual predispositions that can affect how someone makes a decision. Individual predispositions that can influence how an investor makes their decision. One of the most important things to remember about emotional biases is that they not deliberate, but rather a spontaneous decision. Let’s review some of the biases take can affect an investor’s decisions. Investors can often become overconfident due to the belief that they have better information or are processing information better than others in their field. However, overconfidence is dangerous as it can often underestimate the power of risk. Additionally, overconfidence can set the odds of good outcomes too high against poor outcomes. Oftentimes, overconfidence will exhibit itself in excess trading or holding very concentrated risky portfolios. Loss aversion is a bias where an investor will focus on gains and losses related to risk, as opposed to the returns related to risk. In other words, this means that a 10 percent loss has a greater impact than a 10 percent gain in an investor’s decision-making process. This bias is most common when investors lose money and choose to hold on to stocks in hopes of earning back their lost profits — this way, they will not have to sell the stock at a loss. Investors generally will place a greater value on owned investments instead of potential investments in the future. Individuals that follow this bias will often purchase assets that they are most comfortable and familiar with. Investors that follow a status quo bias are often slow to change their strategy or react when the time is right. For example, those that invest aggressively may not want to change their asset allocation to a more conservative approach, even if they recognize that they have become more risk-averse. The biases listed above can really impact on investors decision-making process, making them more susceptible to emotional investing. Now that you are aware of the common biases, we are going to review some helpful tips that will help investors avoid crucial investing mistakes influenced by emotion. There are a variety of ways to allocate and there are plenty of investment strategies that are designed to help investors reach their goals. Therefore, it is essential that they know and understand the method utilized in their portfolio. Having a solid understanding will help prevent any changes to the allocation of the portfolio at inopportune times. It is essential for investors to have goals and a subsequent plan to achieve them. While these goals may change over time with the fluctuations in the market dynamics, if an investor’s plan instructs to stop trading after three consecutive losses, it is important that they do. This will help keep the temptation and the common emotional surges under control and help investors gain more authority over their decisions. 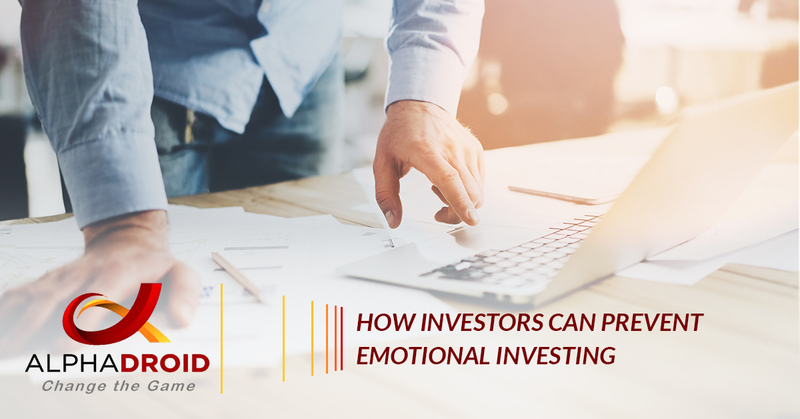 Emotional investing can happen when an investor does not have a long-term plan in place that is customized to meet their specific goals. Without a long-term place, it can be easy for an investor to fall off track and make disastrous decisions. The investment choices made vary from person to person depending on age, income potential, and their long-term needs. Investors that have a low-risk tolerance and a portfolio, that includes stable and well-known companies with steady past performances and long-term growth, will likely be left with not-so-great returns. It is important to remember that the more risk a portfolio has, the more likely it will fluctuate. And, a majority of investors want to have access to the best benefits without taking any risk, which is a highly unrealistic expectation. Creating and establishing a diverse, long-term investment plan in line with financial goals will help investors set practical and realistic expectations for the future. One common mistake investors make is over-reacting when the stock market begins to fluctuation. Even though news of the market plummeting is very much unsettling, taking rash decisions and offloading all your stock could lead to huge financial losses. A stock or investment should be part of a long-term investment strategy that is linked to an investor’s financial goals. A fluctuating market should not influence drastic purchases or sells based on a day’s price — investing in stocks after an upward streak or dumping it after a downfall will not always benefit the investor. Some investors believe that with the right decisions, they can ultimately beat the stock market. One way some believe this is possible is by making constant investment moves help to gain greater returns. Playing the buy and sell game is likely one that investors will not be able to win. Immediate reactions and decisions often are a result from impulsive feelings. It is essential that investors allow enough time to pass and are capable of making a knowledgeable investment decision. Immediately trading after a profit loss is one of the most common reactions that investors make, and like many others, this will soon lead to regret and potentially further impulsive reactions. It is natural as an investor to feel excited about a investment that can potentially be profitable. However, quickly making the decision to buy these investments, even if they are at higher prices, just because the media suggested it will perform well can be a costly mistake, especially if volatile markets are a factor. If following media coverage of the markets makes an investor prone to making emotional investing decisions, it is best that they make an effort to stay away from media sources. emotion out of investment decisions. Using sophisticated algorithmic trading strategies, AlphaDroid makes automated decisions based on “what is already happening,” opposed to cycles, patterns, correlations, or opinions of “what should happen.” With AlphaDroid’s asset allocation software, investors are equipped with a systematic and disciplined approach to proactively catch the best days in the market while ignoring the worst, minimizing the number of decisions influenced by emotion. As you can see, emotional investing can potentially result in significant profit losses. In order to steer away from emotional investing, be sure to keep in mind the information and tips we shared above. However, if you are ready to reduce the role emotion plays in your investment decisions, try a free trial of AlphaDroid. With the algorithmic trading strategies and asset allocation software included, the tedious selection of most algorithmic parameters has been fully automated, making it difficult to let emotion take over. If you are interested in learning more about AlphaDroid, visit our site today!